My ability to see the silver lining in worst case scenarios is pretty uncanny. Tonight that ability escaped me for a few minutes as a wave of shock left me dumbfounded towards the end, but I recovered pretty quickly and found my footing again. As I translated some key scenes, I realized again what I would miss about GFB. It really never was about the end goal of finding that elusive gu family book – it was more about the enlightenment KC found along the way as he learned to accept his new identity as a half gumiho. It might have been that first minute when YW stepped over to his side and took his hand in his transformed state where KC first realized he might actually be accepted by people just the way he is. At that point he was even afraid of himself cuz he had no control over his change, but having YW’s unfailing faith in him that he could overcome this and take charge of his own destiny put KC on the right path of living a fulfilling life as a half human. He owes her for so much more than just being level headed for his sake and lecturing him when he needs it. With her continued faith in him and ever increasing love, I just knew nothing could ever come between them. It seems they tested that theory cuz not even things that are beyond their control stopped their love from existing. *Warning – Get ready with a lot of tissue to watch the first 50mins of this finale cuz it was amazing. It lived up to all its potential and then some. Ask me how much I hated that WR didn’t hug his son. I have been looking forward to their reunion just to see that. I wanted WR to get to know KC for himself and see how great he turned out to be – that there was a good reason why KC had so many people around him who loved and respected him and for WR to feel that fatherly pride from realizing that. All this time people like Lord Park MS, SS, and Choi – all of KC’s other father figures have given hugs and words of comfort during times when KC needed them the most so I wanted to see WR do that too. But as I watched WR put his hand on KC’s shoulder and look into his face, I realized WR didn’t hug him cuz he doesn’t know his son that well. All those other men could tell you everything about KC, but his own father doesn’t know enough about his own flesh and blood. WR does know one crucial key to holding onto a love so at least he was able to impart some wisdom and pass it along to his son. Hopefully KC will follow WR’s advice, but even if KC’s human fallible side doesn’t heed it, at least WR can feel at ease knowing that he did what he could for his son. After all, sometimes it’s not about the length of time you know someone – it’s how much of an impression they leave behind that defines the strength of the relationship. So in that sense, I would say the indelible unfluence WR had on his son is worth more than a thousand hugs. When you think you have nothing left, you hold onto what you have in your arms. You don’t think about anything else and just hold on tight. Right now KC is running on empty when it comes to his emotions. His attention has been pulled in every direction and the truth about his parents is flooding his senses. 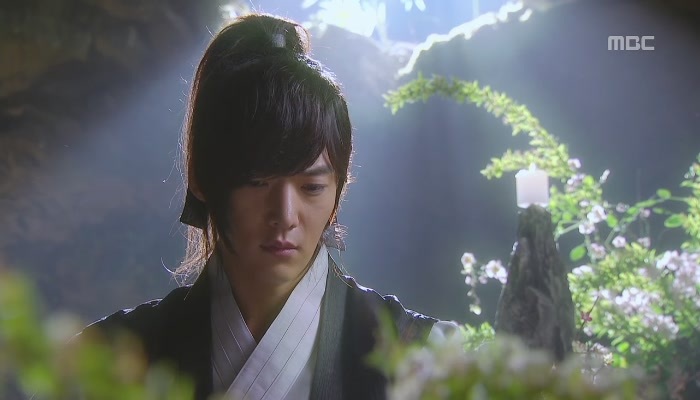 He is on emotional overload right now, but the one thing he has faith in is YW’s love for him and his love for her. If he starts to doubt that or even question it for a second, he might as well pack up and head for the woods. Thank goodness he is standing on firmer ground than he thinks when it comes to YW. Just like his mother was human and made mistakes, YW finally made one with him. Unlike his mother who betrayed the one she loves, instead of turning his back to YW, KC goes straight into her arms. That’s what separates him from his mother and father. SH never believed in her love for WR enough and WR trusted her too much. At least their son won’t make the same mistakes. If anyone has a fighting chance to become human – it’s KC. Not cuz of the gu family book he will find, but the fact that he won’t have to go searching for it alone. Twenty years later, the players have changed and they are making their own rules – this time their love is going to make all the difference in the world. This feels like an entirely different drama now cuz the stakes have never been higher. It sort of makes you wonder if WR found a whole new way to “destroy everything” by starting with the people who didn’t do him any harm. If you think about it – hurting YW would be far more painful to KC than having his own father set out to destroy him. I can’t make out if his grin here is cuz he just realized what would hurt his offspring more or if he just found her interesting cuz she has so much goodness inside of her that his demon side sees that as a challenge. Maybe he even heard her heart calling out to KC so that smirk could mean “I caught the perfect bait.” Anyway you look at it – it’s one of the most chilling scenes so far and with a face as good looking as his – that is no easy task. First time I have to constantly remind myself not to swoon over a demon character, but just look at him – who can help it.